Writer Ken Hollings explores the cultural history and the future of war-gaming and the rapidly converging worlds of computer gaming and war itself. War games are as old as military history but something has begun to change as war and play converge to create what some call the 'military entertainment complex'. Ken Hollings pushes the button on this latest phenomenon. Men have always played at and with soldiers. Gaming has been an essential part of warfare and by the 19th Century it had been developed into the sophisticated "Kriegspiel", derived from the still influential theories of Von Clausewitz and played at military colleges in both Europe and America. These war games then became real games for table-top strategists by the early 20th Century. A remarkable synergy developed between colleges of war and devisers of such games, particularly in America. And in the think tanks of the RAND Corp gaming theory was used intensively to plot the future of war and nuclear destruction. But from the late 1970s computer strategy games started to form a powerful loop between gamers and warriors. With the creation of the SIMNET, the military began to develop hugely powerful simulators and now convergence is taking place between military and the entertainment industry. 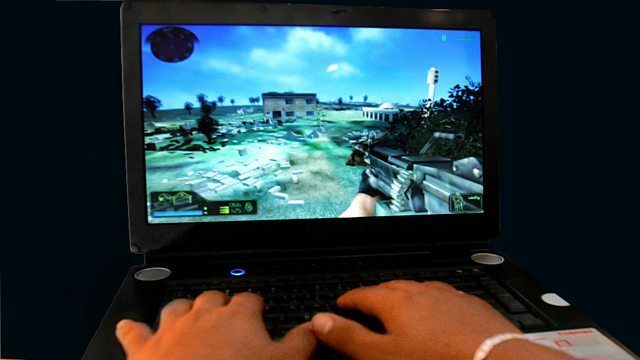 Some say we are living in what Stanford Professor Tim Lenoir has called 'the military entertainment complex', with military functions increasingly taking place online, using simulation for training and in the treatment of soldiers suffering from post traumatic stress disorder. But is this new realm of war truly a revolution - the shape of things to come - or just more virtual bangs for real bucks?